Translate snippets of text instantly. The translation assistant is always at the ready for when you need quick look-up of an individual word , sentence or phrase. A great tool for intermediate language users. 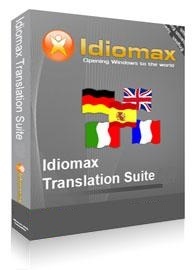 IdiomaX Translation Suite is a bundle of 5 translation products that work everywhere and with every application. If you translate lots of webpages, emails and documents in multiple formats, the Suite does it all. And because it's bundled, you save. Conduct international communications with clients and colleagues. Take your product or service global and increase potential revenues by making your website and other documentation multilingual. Simply and efficiently translate your promotional and advertising materials into the five major languages: English, Spanish, Italian, French and German. Also Convert Spanish to English Sentences, Documents and E-mails. Translate legal documents with confidence using the included legal dictionary. Translate and benefit from cutting edge research by foreign specialists before it is available in your own language. Expand your knowledge of medical / computing lingo and the concepts behind it. Share your medical / computing expertise with others around the world. Write reports using correct terminology.